Spring is officially starting tomorrow and I’m welcoming it with open arms. It means warmer days are right around the corner, which means we are DONE hibernating and park days are in the near future. Fingers crossed. My name is Suzanne and I love basics. Whoever said basic was boring didn’t have much creativity. My style icon growing up was Audrey Hepburn for a reason. She was the classiest of classy and rocked head to toe black like nobody else. And you know what? It was basic and it was AMAZING. 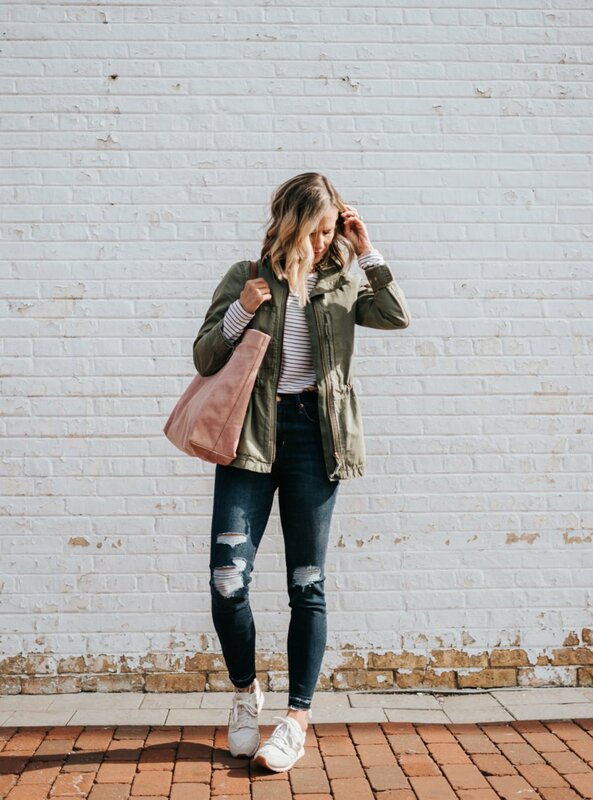 So, today I’m sharing the 5 style basics you need in your closet, especially for spring. And yes, there are more than 5, but let’s just start here, shall we? OK, that’s all I have for today. Stop back Wednesday for a new wishlist, all about home decor! Have a sweet week, friends. 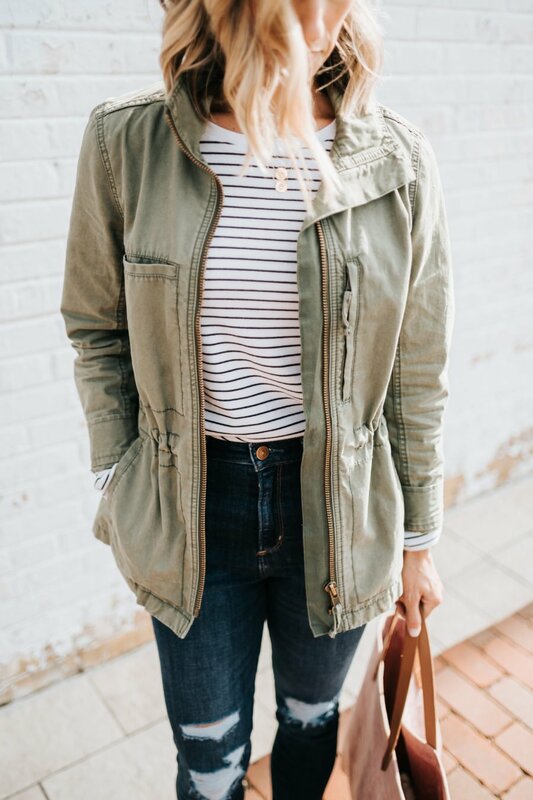 File this jacket under one of, if not THE most worn item in my closet. It’s perfect for these early spring days and goes with anything. Consider it a neutral and pair it with anything and everything. My exact jacket sells out quickly, but is often restocked, so if your size is sold out, be sure to check back soon. Also, this is SUCH an amazing dupe for a fraction of the price. 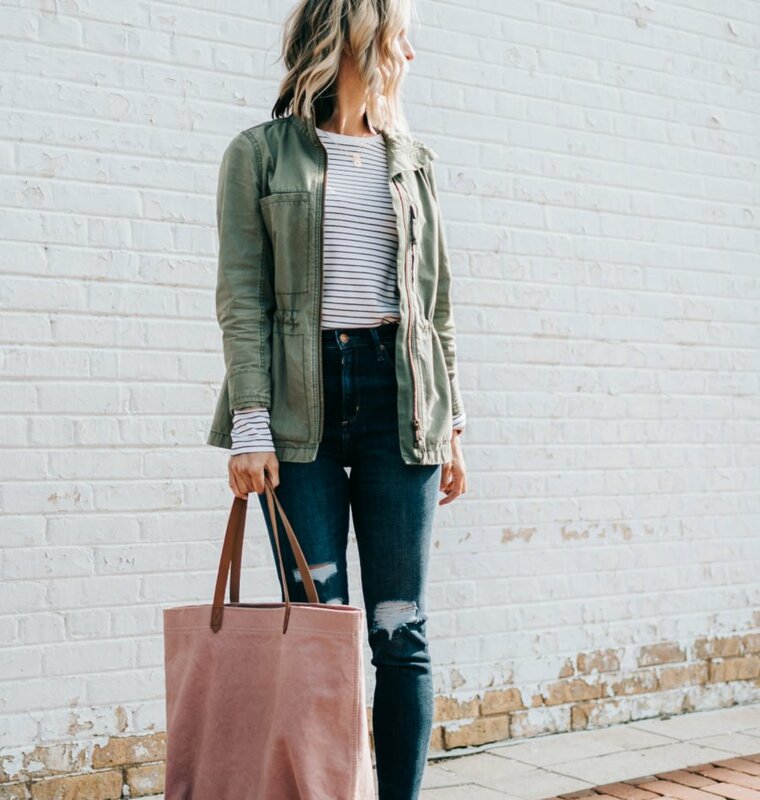 I’ve shared my obsession with this tote since the moment it arrived on my doorstep, and I’ve also carried it every day since. I love a great tote. 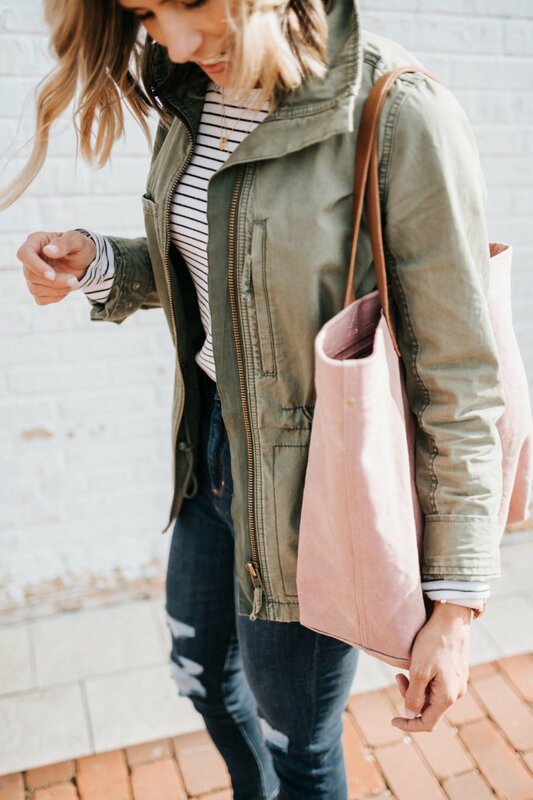 It can hold all of my #momlife essentials, and also look cute. Done. C’mon, you knew denim was going to be on the list, right? 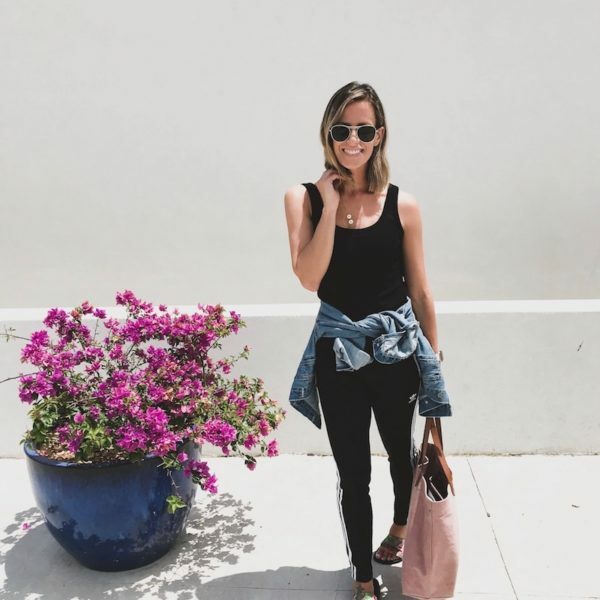 Since I can’t narrow it down to a certain style of denim (in case you’re wondering what makes my must-have list, check out this post), I can only say that your closet isn’t complete without at least ONE pair of denim that you absolutely LOVE. Currently, this is my go-to pair. They’re super soft and comfortable with just the right amount of stretch, and the rise is super high, which means I don’t need to worry about flashing anyone at the playground. Stripes can do NO wrong in my book. Dress them up or dress them down. 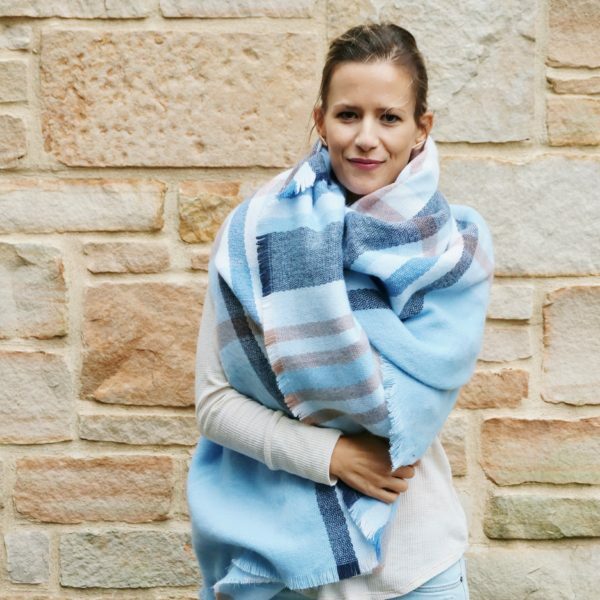 Wear them in winter or summer, spring or fall. Dark or light. Any occasion calls for a stripe, if you ask me. I love all the basics! Love this post mama! 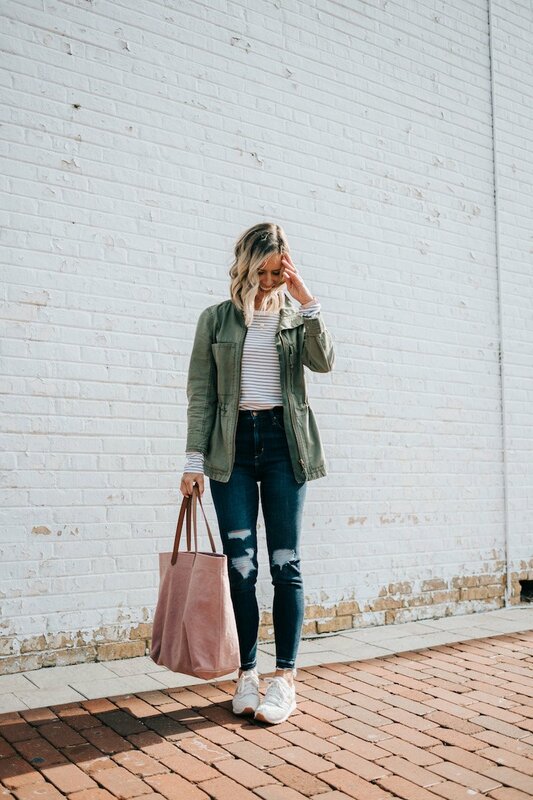 This is such a great look – I am always finding myself going to simple outfits like this on the weekends in spring. Need that blush bag – so perfect. Great outfit! I’d love to rummage around in your closet. You choose the coolest! Well, Looks like this girl needs a stripped Tee. Lovely post! Love your style! I too love a good sneaker! What socks do you wear with your new balance? I totally agree! Striped Tees are one of my favorite basics! You can dress them up or down so easily! I definitely need to add more basics to my wardrobe! Love your look! I love all of these! That jacket is so cute on you – and so agree with the cute sneakers!